San Francisco is often called "Everyone's Favorite City," a title earned by its scenic beauty, cultural attractions, diverse communities, and world-class cuisine. Measuring 49 square miles, this very walk-able city is dotted with landmarks like the Golden Gate Bridge, cable cars, Alcatraz and the largest Chinatown in the United States. A stroll of the City's streets can lead from Union Square to North Beach to Fisherman's Wharf, with intriguing neighborhoods to explore at every turn. View of the Pacific Ocean and the San Francisco Bay are often laced with fog, creating a romantic mood in this most European of American cities. San Francisco was incorporated as a City on April 15th, 1850 by act of the Legislature. Although City Government has played a key role in San Francisco's development, the true wealth of this City resides with the creative and entrepreneurial spirit of its pioneering Citizens. 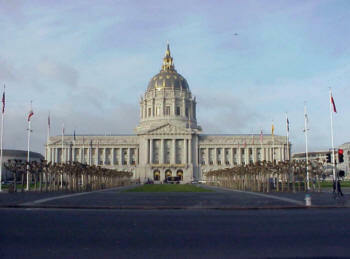 The City today is governed by the Mayor and the Board of Supervisors.